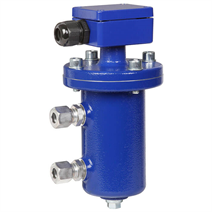 Use for turbulent liquid levels such as in oil sumps in large engines, gearboxes etc. In an external chamber (bypass chamber), a float with a permanent magnet moves on a guide tube in relation to the liquid level, following the principle of communicating vessels. Within the guide tube is fitted a reed contact (inert gas contact), which is energised, through the non-magnetic walls of the float and guide tube, by the approach of the float magnet. By using a magnet and reed contact the switching operation is non-contact, free from wear and needs no power supply. The contacts are potential-free. The switching functions always refer to a rising liquid level. The float switch is simple to mount and maintenance-free, so the costs of mounting, commissioning and operation are low.